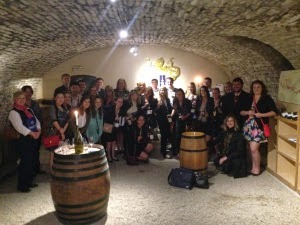 (May 22, 2014) – As the day before was devoted to chardonnay, it was only fitting that our third and last day in Burgundy was devoted to pinot noir. Therefore, we headed north of Beaune to the famous Cote de Nuits where the largest percentages of Grand Cru pinot noir vineyards are located. First stop, at 9am, was Domaine Dufouleur in Nuits St. Georges, where we met with the charming Maximilien, Export Sales Manager. 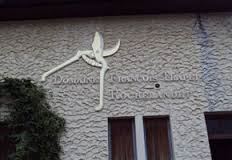 Established in 1848, Dufouleur is both a negotiant and an estate. They farm only 25 hectares, but produce over 1 million bottles per year with their negotiant role. An interesting fact about their cellars, which were originally built in the 17th century, is that there is documentation that Napoleon actually visited there. Therefore, when Max led us down the stairs to the dark cellar lit by candlelight where we had the winetasting, everyone glanced around wondering where Napoleon had stood. To commemorate this special piece of history, Dufouleur has named their entry level pinot noir, Cuvee Napoleon. It was only fitting that we started with this wine and a toast to the self-proclaimed emperor who always believe that the Cote de Nuits created the best wine in the world. We ended up tasting a total of 9 wines, starting with 4 pinots noirs, then moving onto 4 chardonnays, and ending with a Cremant de Bourgogne. A favorite of the crowd was the 2011 Gevry-Chambertin with dark cherry and complex notes of tobacco and spice. Our 10:30 appointment was at Domaine de la Vougeraie, where we met with the Estate Manager Pierre and Benjamin, Assistant winemaker. 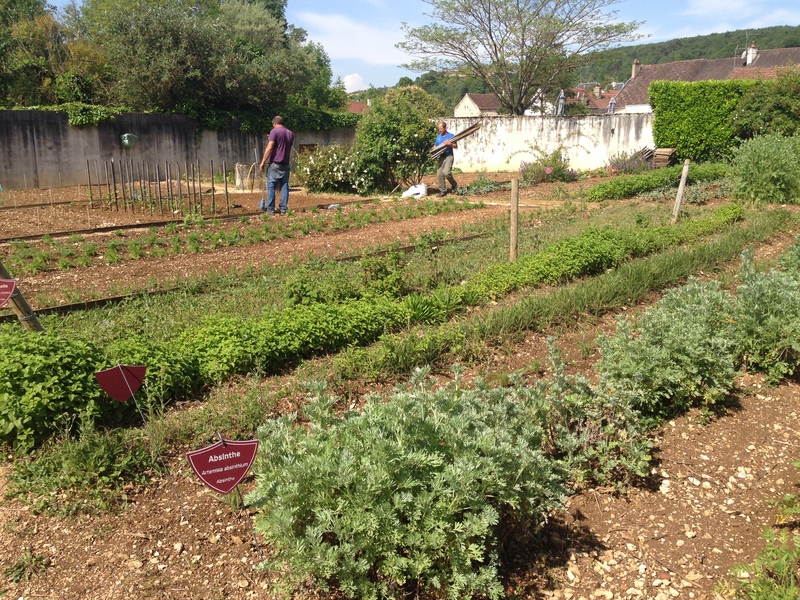 Benjamin immediately took us to the biodynamic gardens in the back of the estate and we were very impressed to learn that all of the herbs growing there went into making the teas used in the biodynamic preps that are sprayed on the vineyards. Vougeraie has 40 hectares of vineyards, and is the sole owner (monopole) of a rare section of chardonnay in the Clos de Vougeot grand cru vineyard. Next was a tour of the cellars where we learned how they craft both the chardonnay and pinot noir. At Vougeraie they do often includes some stems in the pinot noir fermentation, which is conducted in large wooden foudres with both pigeage and pump-overs. Natural yeast is used, and total maceration usually takes 15 days. They use a large basket press, and then age in small oak barrels (30% -60% new), that they make themselves, for 15 – 18 months. We tasted three wines: 2007 Vougeot Premier Cru Le Clos Blanc de Vougeot, 2009 Nuits St. Georges Les Damodes and 2004 Grand Cru Clos de Vougeot. Many in our group took the opportunity to purchase the final wine, which had a perfumed nose of black cherry and great structure. It seemed to be a good deal at $53 euros per bottle. After lunch in Nuits St. Georges, we drove to the charming village of Gevry-Chambertin for our 2:30 appointment at the small winery of Domaine Trapet-Rochelandet. Here winemaker and co-owner, Marie Cecile, explained the winemaking process and allowed us to taste her excellent wines. As she only spoke French, Francy jumped in to translate for us. The domaine owns 7 hectares of vines, primarily pinot noir, but also some aligote – the other white grape of Burgundy. In addition to enjoying the lovely Gevry-Chambertin’s she made, everyone was excited to try their first Aligote wine at Trapet-Rochelandet.